One of the most common reasons why virtualization projects fail is due to the lack of attention to the design of the physical infrastructure on which your virtual infrastructure will reside. Join this session to understand some of the key design choices that you should consider in order to minimize risk. 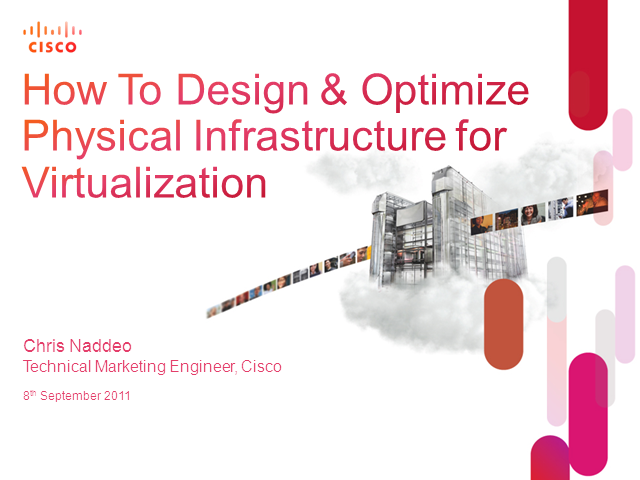 You will learn best practices and practical tips to help you ensure that the physical infrastructure you deploy will provide a solid foundation for virtualization. Chris Naddeo is a Technical Marketing Engineer for the Cisco Unified Computing System (UCS). His focus is on the storage connectivity aspects of UCS working closely with the storage partner ecosystem on joint projects, Cisco Validated Designs and certifications. His also is responsible for meeting with potential and existing UCS customers and educating Cisco field sales on the UCS platform. Prior to Cisco, Chris worked at NetApp where he was a field sales consulting system engineer focusing on Oracle on NetApp best practices as well as the Data ONTAP GX platform. Prior to NetApp he spent over 8 years at VERITAS/Symantec in a variety of roles including field sales specialist, Technical Product Manager, and Sr. Manager of Product Management. His focus while at VERITAS was on current and next generation volume management and file systems. Chris is based out of the Philadelphia, PA area.